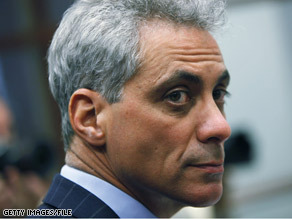 President Obama's Chief of Staff Rahm Emanuel issued a government-wide directive Tuesday. WASHINGTON (CNN)- President Obama has wasted no time handling the Bush administration's unfinished business. White House officials tell CNN Obama Chief Staff of Staff Rahm Emanuel sent a memo Tuesday to all agencies and departments of the federal government. The memo halts further consideration of pending regulations throughout the government until a legal and policy review can be conducted by the Obama administration. Way to go, guys!!! Let's hope Al Qaeda, Iran, Syria, Hezbollah, and Russia will wait for your "review". Awesome!!!! Way to Go Chief Staff of Staff Rahm Emanuel ! Change we can believe in! Commendations! Unfortunately, today is the hight of the Obama administration....Like almost all presidents...it's pretty much down hill from here...I hope that is not the case...but at some point reality will set in for all of us. nothing new, this has been done down thru all in coming administrations; and a good thing at that.. Here we go! 🙂 We have a leader now.... the People's President! Go Eamuel! I am usually not one to hold grudges, and for the most part I am not going to hold grudges against Bush, I think he meant well, but boy am I glad we can end some of the rediculous decisions his administration made... and also very happy to see that Obama and his administration are ready to go to work so quickly! Trust --- but verify -- very smart move. He handwritten prayer left by Barrack Obama in the cracks of Jerusalem's Western Wall; Lord _ Protect my family and me. Forgive me my sins, and help me guard against pride and despair. Give me the wisdom to do what is right and just. And make me an instrument of your will. The prayer has been answer ! For the negative commentator, Bitter, angry, losers....sore losers, racists, bigots, religious zealot fools. YOU GUYS LOST IN A LANDSLIDE. WE WON YOU LOST. We had 8 years of your way, and look where the country is economically. The country spoke loud and clear, and of course being the good patriots you all profess to be, I will expect you to support our new president...or more likely remain the shallow hypocrites you always have been. gee ken.. youre the smartest ... blind sheep are ya??? baaah baaaaah baaaaaaaaaaaaaaah.. cause only a blind sheep wouldnt question every single action taken by the bush administration..
you are living in a new world, get used to it, or get out.. i think alaska has some room avaiable, and they secede.. perfect for all the types akin to you. guess the Dems just couldn't wait a minute longer, we sure are gonna be in trouble with them at the helm. Hey Ken, go buy some more canned meats and ammo for your fallout shelter. these dopes will further wreck the economy. remember emanuel was too good to serve in the US military but served in the israeli military. Rham, doing his job the way we knew he would. Way to go Rham!! Ummm.... I thought they were for more regulation? Of the crippling variety preferably. We need to cripple this economy. this new administration has started working already? wow, 8 years quiker than the bush administration! Look it up, this is standard procedure. The news coverage from many sources said so. George W. Bush and every modern president before did the same. Good start Emanuel!!! Anything that Bush left should be revised!!! Rahm is on the job doing what President Obama expect him to do. I hope they stop some disastrous policy before it's too late. Some people need to stop and think before they criticize every decision this new administration makes. Smart. Obama staff going through the checks and balances. Wow Ken, that may well have been the poorest troll attempt I've seen in months.